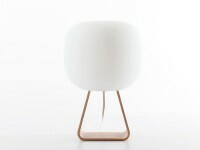 Himmee is a Finnish company created by the designer Timo Niskanen in the 2000’s. Himmee produce his own creations, mainly lightings. « This is what I have been doing all my spare time for the past year and a half. And now here it is; HIMMEE. I am Timo the founder of Himmee, a designer, a lower secondary shool shop class teacher and last but most importantly a father of two sons. Back in my childhood I built Legos and my NHL career was left as a distant dream. During my professional career I have designed products, marketing material and everything related. As my own mission I have travelled around the world carrying my lamps around and trying to find right manufacturers for them. I have found a few good ones but the collaboration has always ended for various reasons. Bored with constant calculating and compromises, I put the lamps aside and concentrated on teaching. However, passion attracted me to lamp design again and the idea of my own lighting brand developed in my mind. I had doubts about leaping from being a designer to handling the whole business. Encouragement from my loved ones helped and I decided to launch my own lighting brand.